Another book done! This time, it was 'Salem's Lot, by Stephen King. 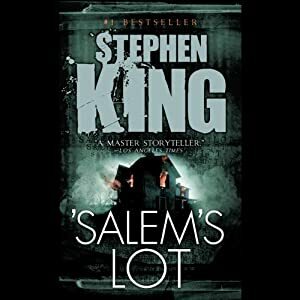 While I'm not a Stephen King fanboi, I do like his style quite a bit and marvel at his productivity. I can only recall one book of his that I've read that I didn't care for very much: The Eyes of the Dragon. I won't cover why here, except to say that I liked it OK but didn't think it compared well to his other works. Content: 5 out of 5 stars. Yes, you read that correctly -- 5 stars. You should read this book if you haven't already. And also as usual, I "read" the book via audible.com. The narrator (aside from Stephen King's reading the forward himself) was Ron McLarty. I thought his handling of the accents as well as the intonations used to distinguish the characters was great. It got a little muddy at times where four male characters were in the room speaking to each other, but I didn't stumble too much. I don't recall much production value beyond the narration itself -- no background or transitional music at all, no sound effects, etc. Given that most of the time the sounds are more a distraction than anything else (this isn't a radio program, after all), this is absolutely fine with me. Narration/Recording: 4 out of 5 stars. TL;DR - you should read this book. Even if audible.com is your only reading option, read it!